Today I have another Serum No. 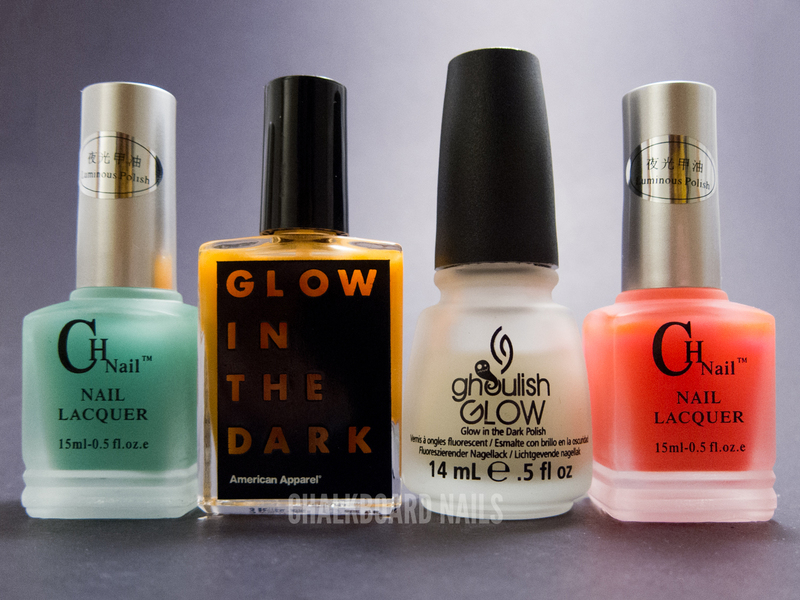 5 lacquer to share with you: Day Glow. Day Glow is the most popular lacquer in the Serum lineup -- and it's not hard to understand why! 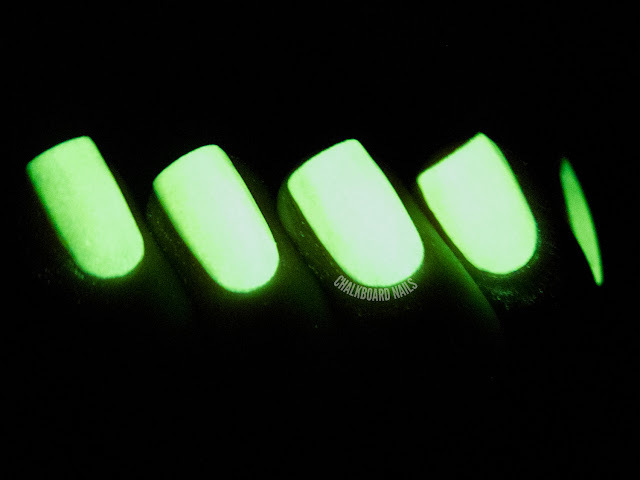 This glow in the dark polish will knock your socks off! By day, it is an unassuming pale yellow with hints of green. Application was a bit tricky for me; I thinned my bottle out a bit and still had to go slow when applying. However, I did only need two coats for the photo below! 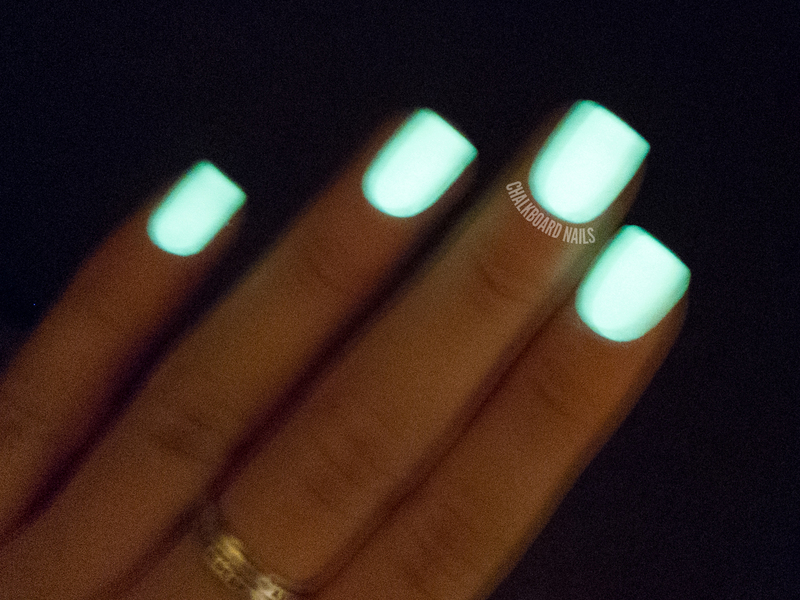 Day Glow dries quickly and matte, almost with a bit of grain to it, and smooths out flawlessly with topcoat. This next photo was taken just by shutting off the lamp that I use with my lightbox. I didn't hold it up to the lamp directly to charge it like I do with most glow polishes, and there is still ambient room light coming into this shot. It's essentially a dusk or shade type situation, and it's already glowin'! You can see where I'm going with this right...? Then I walked down the hall a bit further and stuck my hand into my dark office from the doorway. The hallway lights were still on, so you can see my fingers are lit up a bit as well. The glow was insane! 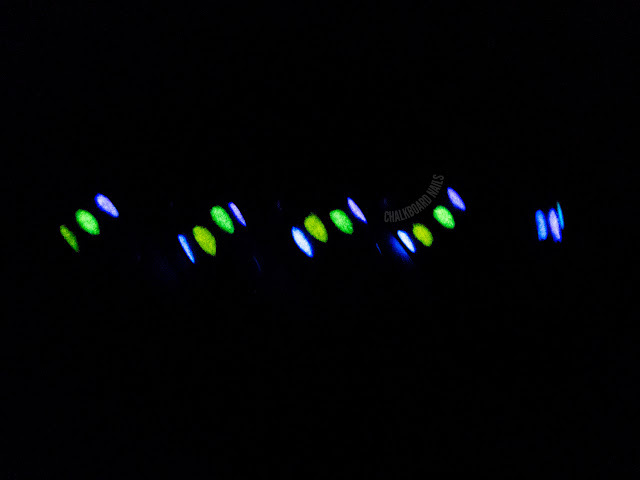 Finally, I did a photo of Day Glow in my usual glow in the dark polish setup -- a pitch black room. The glow was crazy, and it just lasted and lasted... It didn't fade out nearly as quickly as most of the other glow polishes I've tried. It's so strong and bright that it almost seems to have overexposed the shot! I was so entertained that I even made a video of my floating fingers. Day Glow is sold in the Serum No. 5 Etsy shop and Mei Mei's Signatures. It's very popular, so it's out of stock now, but there will be a restock on Monday! Be sure to like Serum No. 5 on Facebook and follow on Tumblr to keep up with restock information. 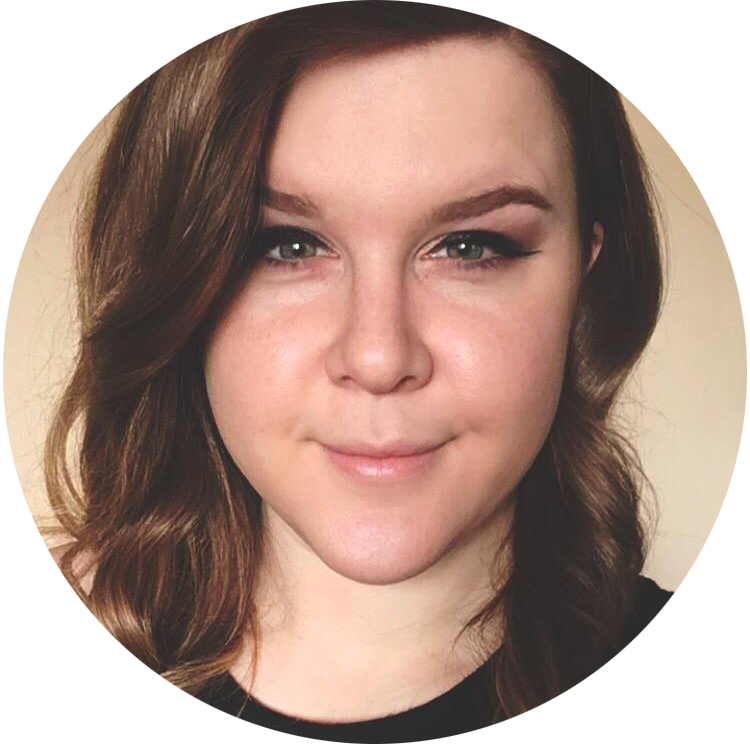 20% of all Serum profits go to charity. In related news, Serum No. 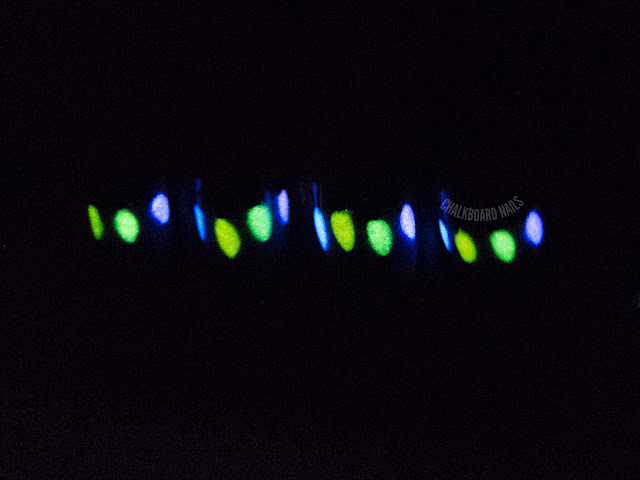 5 is taking a poll on Facebook to help decide on a new, upcoming glow in the dark shade! Go sound off if you have a chance! Hey friends! I hope you had a great holiday! Thanks for sticking around while I took a few extra days for the family celebrations and stuff. We're kicking off today with some nail art using the new Nicole by OPI Modern Family Collection! I've seen a good chunk of the Modern Family series, but unfortunately I'm not caught up. Why the heck isn't it on streaming Netflix!? Anyway, every single episode of this show I've seen has been hilarious; I hope to watch all of it eventually. For this design I did a bit of a geometric look. I was hesitant about mixing the silver in with the cremes but it actually ended up being one of my favorite parts of the manicure. 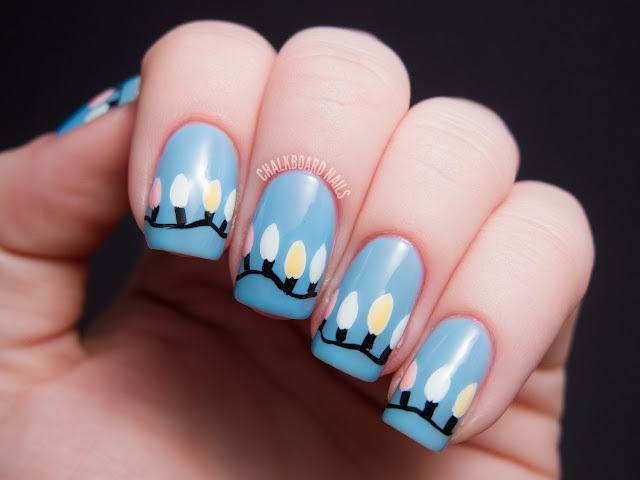 I freehanded these shapes, but if you want to try it out and you feel more comfortable using tape, then by all means use tape! It would be more precise, of that I'm sure. I began with a base of Nicole by OPI My Jay or the Highway! which is a warm khaki creme. My obsession with neutrals continues -- I think this shade is lovely. I only needed two coats and the formula was excellent. Then, I freehanded on triangles using Nicole by OPI Alex By the Books, which is the minty green. 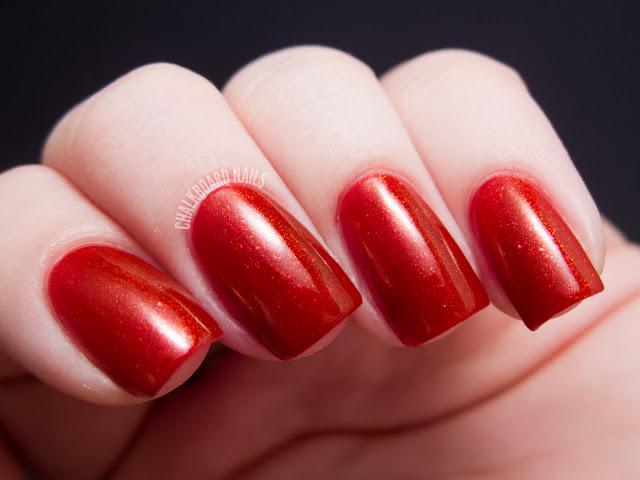 This shade was creamy as well, and would need just two coats for opacity if worn alone. I followed suit with Nicole by OPI A Like-Haley Story..., a hot pink with subtle shimmer. 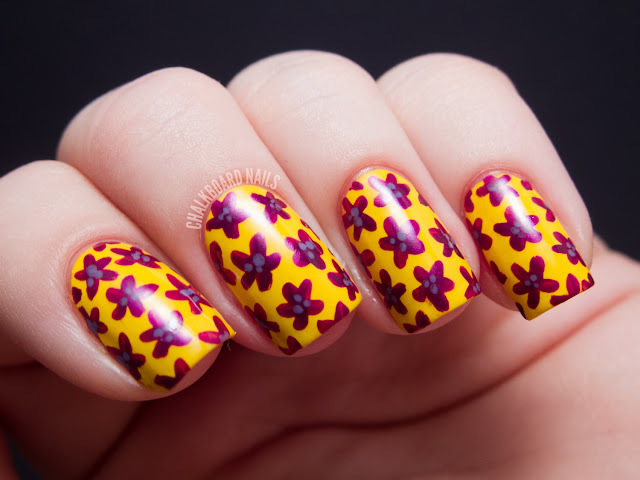 Again, great formula and would need two coats. Finally, I added the metallic sections using Nicole by OPI A Phil's Paradise, a sparkly gunmetal shade. It's no surprise by now: lovely formula and just two coats needed! What was surprising, however, was how much I liked A Phil's Paradise. I am not normally a fan of metallic shades, but I found the sparkle and richness of this one to be really appealing. Alex By the Books ranked highly for me as well. All in all, I enjoyed the way this came out. The design and color mix feels kind of Madeline Poole-esque to me! The manicure in today's post happened mostly on a whim! I was having trouble deciding which polish I wanted to wear, so I chose three and then took them to Instagram for help deciding. The polish they ended up picking was Contrary Polish Desert Fruit, but then I wanted to embellish it a bit! 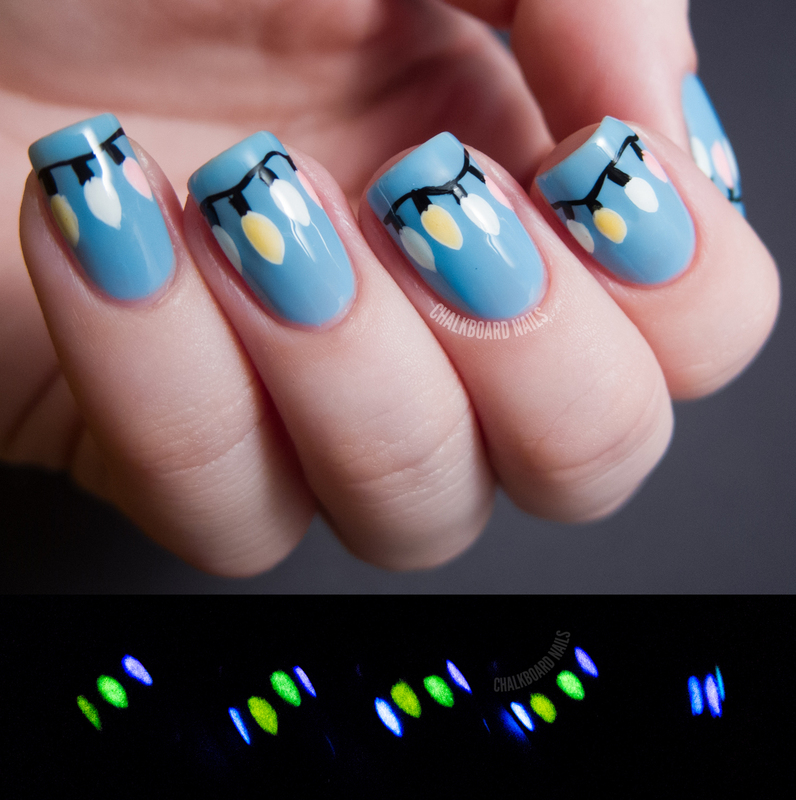 I used 1.5mm round golden studs from BornPrettyStore for the accent nail. They are a very cool-toned gold shade and almost look silvery in certain lightings. When I'm using studs, I work column-by-column. I begin by applying a thin strip of topcoat where I want to apply the studs so they will stick to the nail. Then I use a dotting tool to pick up the studs -- it will pick them up well if it is wet (I've dipped it in water or licked it in the past). You will have to continually wet it as you work. Then, once you're done, you can finish the nail with topcoat to seal the studs in. I really wanted the nail to be completely covered, so I tried cutting studs in half for the empty spaces that were at the end of my nail. Surprisingly, they cut easily with safety scissors. I think they are mostly made of plastic and then topped with thin bits of metal? Anyway, they cut well and I was able to finish off the edge of the nail evenly. The base color, Contrary Polish Desert Fruit, was rather difficult to photograph. It came out of my camera looking pure brown, which is strange as it is a reddish purple and my camera is not usually THAT inaccurate. I spent some time working with the color in Photoshop and was able to get it much closer to what this shade looks like in person. Here is the polish in direct light -- the shimmer in it is much more visible in these conditions. Isn't it funny how the stud nail looks so much shorter and fatter than the others? I really enjoyed wearing this look, and even a few of the men at my work were interested in the stud accent. Most people wanted to touch it, and I can't say I blame them -- it felt very cool and I couldn't resist feeling it the whole day I wore it. 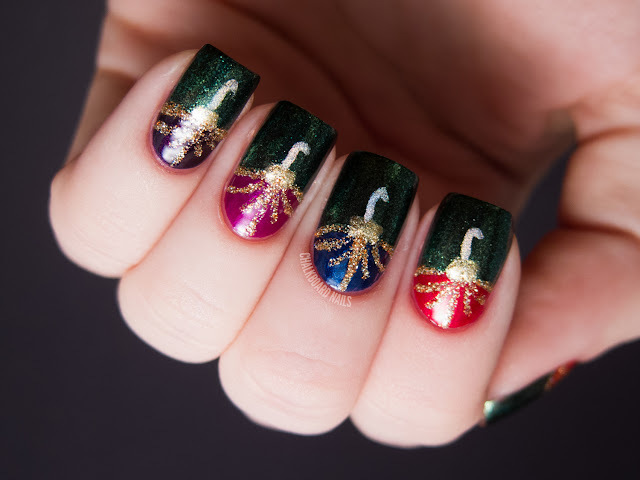 There's still a bit of time left to squeeze in some holiday nail art! Today's design is intended to look like sparkly, glitter-embellished ornaments hanging on a tree. I chose to use the half moon technique to make the ornaments. You can find an example of how to do them in my extremely old post found here. The bases of the ornaments are (from pinky to thumb) Illamasqua Baptiste, Nicole by OPI Pretty In Plum, MAC Hyper, LCN Ruby Red, and OPI Deutsche You Want Me Baby. The green of the "tree" is mostly Zoya Logan with little bits of China Glaze Running In Circles brushed on. The gold glitter on the ornaments is China Glaze I Herd That, the gold attacher pieces between the hook and the ornament were done in Zoya Ziv, and the hooks are Color Club Worth the Risque. Good morning folks! 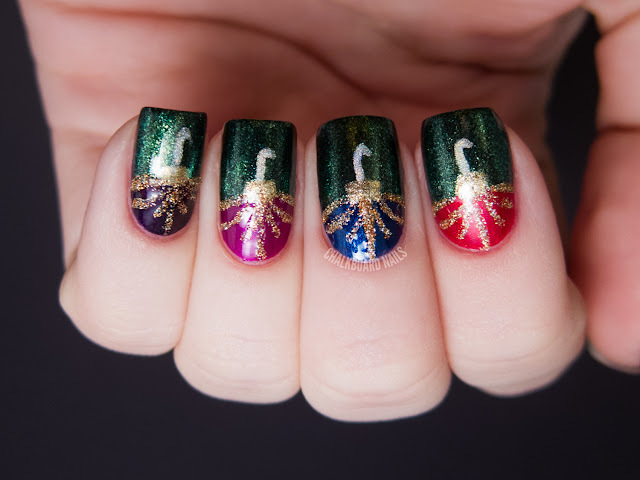 Today's pose was made using a unique holiday collection from GlitterDaze. The collection is made up of seven polishes that change from a pastel or even sometimes clear shade to a bright jellylike color depending on temperature. These polishes work best on a light colored base. 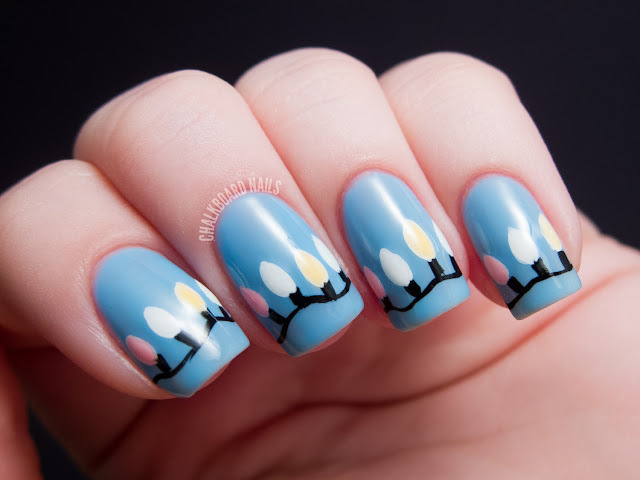 I chose to use a white jelly and a white creme as my bases for these manicures. The GlitterDaze polishes are most pigmented when your hands are cold, and are either clear or faintly colored when your hands are warm. They also have little darker specks in them, which I assume is due to the ingredient that makes them temperature sensitive. Here is what they looked like after I ran my hands under hot water. 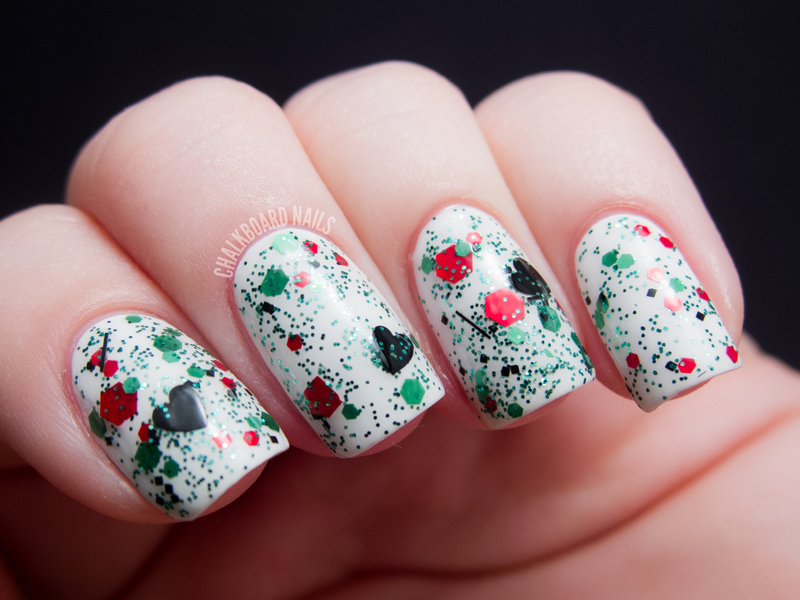 For my second look, I painted some holly with GlitterDaze's Under the Mistletoe (green) and Christmas Kiss (red). 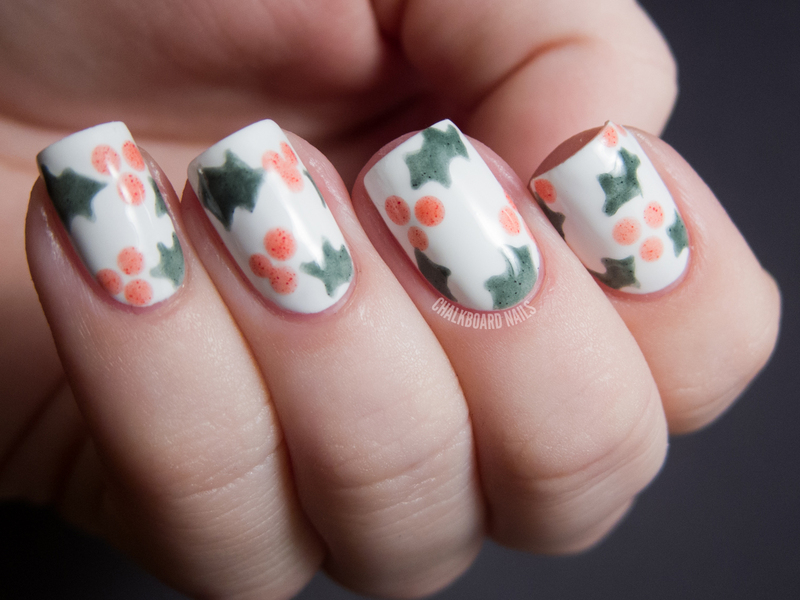 The opacity of these two shades over white made me think of faded Christmas wrapping paper, in a nice way! This is my favorite of the two manicures I did. Here is what they looked like after I ran my hands under hot water. This change was pretty drastic, but rest assured your hands will almost never be as hot as mine were for this photo and will likely allow for a bit more color than this. I think the fact that these polishes are a winter collection is quite appropriate, because I know in the winter my hands are cold more often than not! 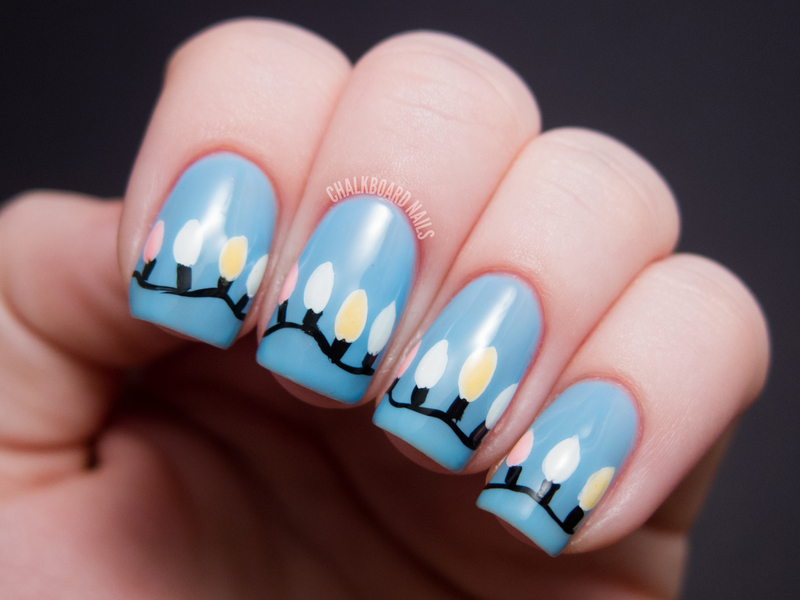 They might be less practical in the summer, because the polishes would be warm most of the time and therefore less pigmented. 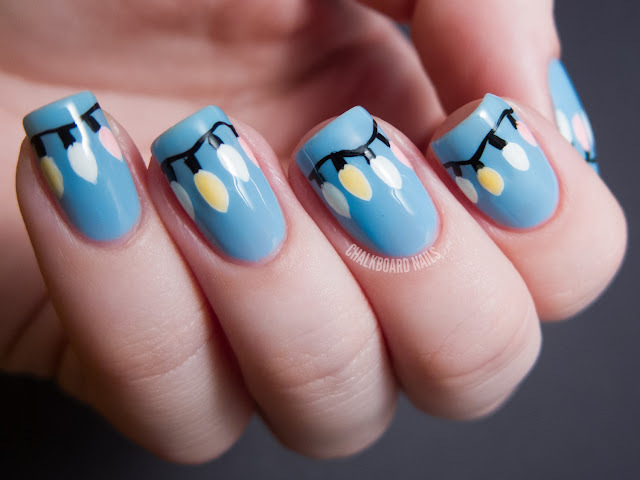 Overall, I think this is an interesting idea for a collection, and I haven't seen polishes like it this season. I do think that this collection would be more wearable if it changed from one color to another, instead of from clear/pastel to pigmented, but still a novel addition to my collection and fun to impress friends with. If you'd like to see swatches of the shades from this set that I didn't use, you can check out the album on GlitterDaze's Facebook. You will then be sent a PayPal invoice. Please keep in mind that it may take up to two weeks to get back to you. You can keep up with GlitterDaze on Facebook and at the GlitterDaze shop. There was a new collection announced today, a giveaway going on, and the last day of the Christmas sale is in the shop, so don't delay! I don't know about you guys, but I love yellow nail polish. I don't think it gets enough credit -- it's a very bold and trendsetting color to wear on your nails! 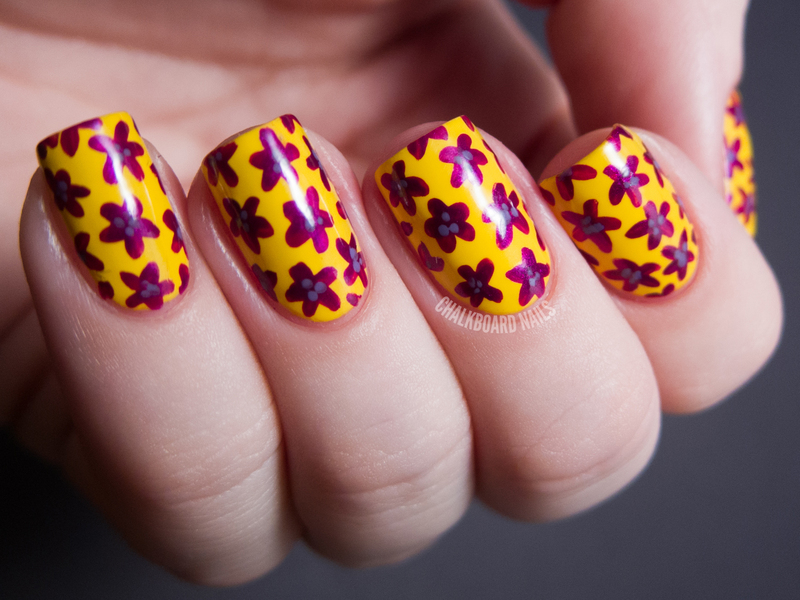 I was so excited when I learned that the Nicole by OPI Selena Gomez Collection included a yellow, and I used it as the base for today's small floral print. 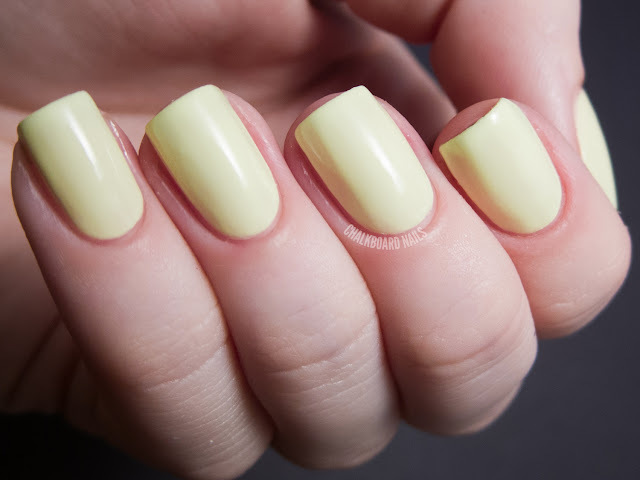 Nicole by OPI Hit the Lights is a warm, bright yellow shade. I found its application to be pretty standard for yellows. It was a little streaky and required three coats to even out, but I am glad to report that it didn't turn out lumpy or thick at all. It's definitely one of my new favorite yellow shades. I think the warmth in it looks particularly nice with my skin tone! 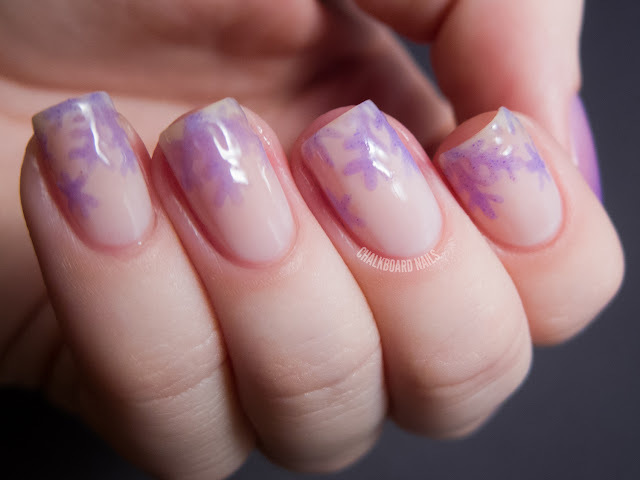 The flowers were freehanded on using my medium length nail art striper brush and Nicole by OPI Pretty In Plum. This reddish purple reminds me of real grapes! It is a gorgeous glowy shade with pretty shimmer. Finally, I dotted on three little spots of Nicole by OPI Love Song, a lovely lilac. I also used this shade in my Girly Pinwheel Candy manicure! I am a huge fan of lilacs (maybe one of my top three favorite polish colors!) and this one is quite pretty. Hey folks! Hope you're having a nice Saturday! 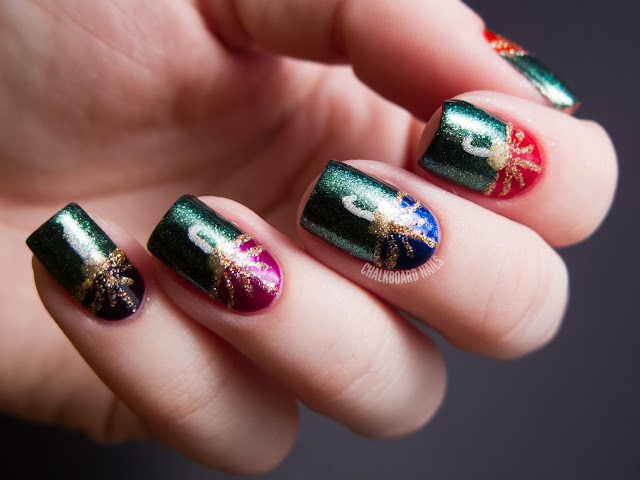 This afternoon's post includes two glitter gradient manicures that I did using some of the polishes from the Cirque Objet d'Art Collection. First we have a gradient from the cuticle up using Cirque Galinda on a base of Illamasqua Cameo. 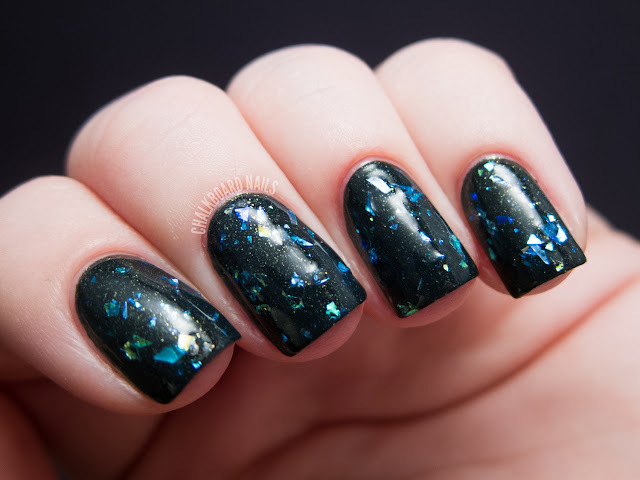 I am so enamored with this glitter! It's a mix of sizes of pearly white glitters and contains bit of iridescent shimmery particles as well. I see snowfall when I look at it and that makes me happy. My second glitter gradient goes from the tip of the nail down. I began with a base of three coats of Cirque Cape Liz (also from the Objet d'Art Collection!) and then added a gradient of Cirque Hellebore. This manicure looks like a brushy watercolor painting of a field of grass and a hazy sky to me, or maybe some seaweed underwater. Either way, I was pleased to learn that these colors complemented each other well. Hellebore also has some interesting pink sparks in it that show up when the light hits it just right, but unfortunately it is hard to capture in photos! I had no problems with formula on any of these polishes. They all applied nicely and the glitters had good density! The Cirque Objet d'Art Collection is available for purchase now on cirquecolors.com as well as from international stockists Pshiiit Boutique and Mei Mei's Signatures. The Cirque polishes in this post retail for $13. You can also follow Cirque on Facebook for news and other updates!